Campfire Audio arrived on the scene in 2015 with the release of its Jupiter, Orion, and Lyra earphones, followed in 2016 by members of Campfire’s “Liquid Metal” earphone range, plus the flagship Andromeda model covered here. Campfire is a start-up company with a pedigree, in that it is a spin-off from ALO Audio, an Oregon-based firm famous for its specialized personal audio cables, headphone amplifiers and amp/DACs. Industry veteran Ken Ball serves as the president of both companies. 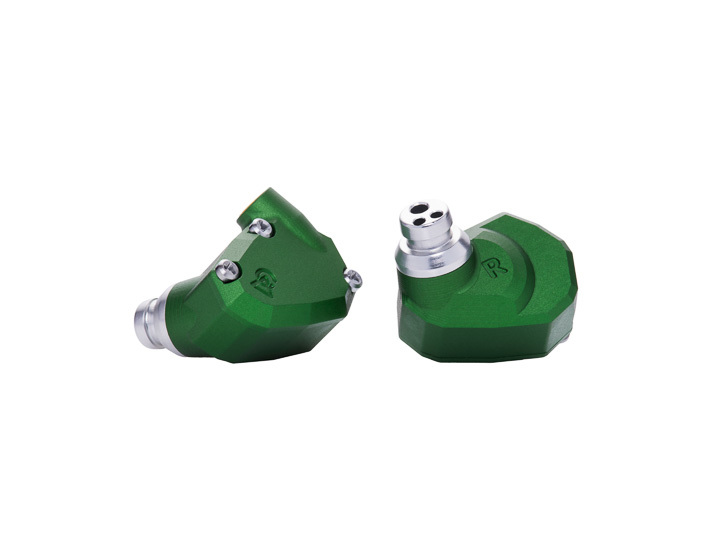 The Andromeda features angularly shaped, matte finished earpieces CNC machined from aluminium, with matching metal faceplates attached with recessed, miniature cap screws. The earpieces are fitted with very high-quality Campfire beryllium-copper MMCX-type signal cable connectors. One small caveat: because Campfire’s earpieces are somewhat angular, it would be good to do a test fit to make sure they are comfortable for you (they are for me). Campfire models each have distinctive colours and the Andromeda’s arrive in a beautiful Kelly green-anodised finish with accents in the form of silver-coloured metal sound outlet ports. The three-way Andromeda uses five balanced armature-type drivers per earpiece, grouped as two high-frequency drivers, one midrange driver, and two low-frequency drivers. Outputs from the mid and low-frequency drivers are directed outward via traditional bore tubes, but the high-frequency drivers are treated differently. Instead of a “traditional ‘tube & damper’ tuning system,” says Campfire, the Andromeda’s dual high-frequency drivers are loaded into a 3D-printed Tuned Acoustic Expansion Chamber™ (T.A.E.C.) said to provide the requisite “acoustic tuning without compression”, thus yielding uncommonly extended and open-sounding treble response. Andromeda is an earphone created by and for audio purists. It is a well-balanced all-rounder that offers nearly ideal neutral tonal balance, with a substantial amount of resolution—especially when it comes to capturing spatial cues in the music. The Andromeda might exhibit a very subtle degree of bass emphasis, but this mostly serves to give a sense of more solid grounding whenever foundational bass elements are present. Like many fundamentally neutral transducers, the Andromeda sounds so disarmingly natural that it can at first seem self-effacing, though it is simply standing aside to let the music tell its own story. In practice, the Andromeda proves highly transparent to its sources. When the music is well recorded and rich in emotional content, the Andromeda sounds accomplished, expressive, and nuanced. But, on recordings that sound flat, compressed, or lacking in focus, the Andromeda will honestly reveal those shortcomings. What this means is that the better the recordings you play and the better your ancillary equipment is, the more you will be impressed by the Andromeda’s sound. I found the Andromeda competitive with top-tier models from firms such as JH Audio and Westone (many of which carry higher price tags than the Andromeda), which is to Campfire’s credit. A track that highlights the Andromeda’s strengths is Dead Can Dance’s “Anabasis” from In Concert[PIAS America, 16/44.1]—a well-made live recording of the famous electro-acoustic ensemble led by Lisa Gerard and Brendan Perry. This atmospheric track combines both powerful yet delicate high and low percussion instruments, a wide variety of other acoustic and electronically synthesized instruments, plus haunting, Middle Eastern-influenced vocals. Through the Andromedas, the variegated textures and tonal colours of ‘Anabasis’ are brilliantly revealed, so that the track sounds by turns dark, brooding, shimmering, soaring, and majestic. Importantly, the Andromeda’s superb low-level resolution gives the earphones an uncanny ability to capture subtle concert hall sounds and the almost electric atmosphere and ‘feel’ of a live event. The Andromeda is a serious purist’s earphone that does all things well and that offers particularly good top-to-bottom balance and coherency, plus very effective rendition of spatial cues in the music.